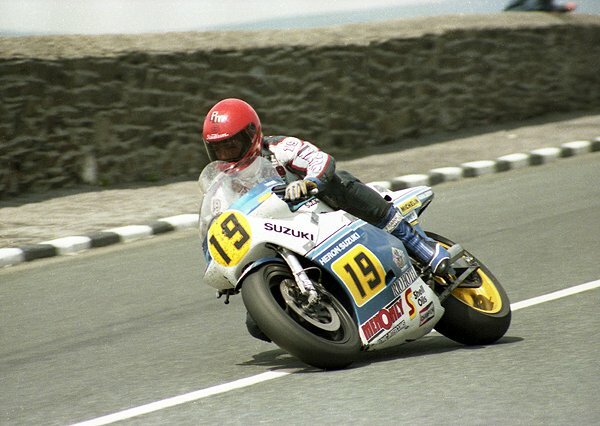 McElnea made his TT debut in 1982 after twice leading at the Manx Grand Prix before retiring and a year later he was a fully-fledged member of the factory Heron Suzuki team alongside Mick Grant, the duo going head to head with the Honda pairing of Dunlop and Roger Marshall. McElnea won that year's Senior Classic TT ahead of Con Law with Joey back in third and the following year the two rivals would be involved in more titanic battles. Dunlop came out on top in the World F1 Championship race but the mid-week Senior TT race would prove to be one of the best ever on the island. There was little to choose between the two for the first five laps as the lead constantly changed hands with McElnea smashing the outright lap record on his second lap, beating Norman Brown's mark of 116.19mph with a lap of 118.24mph. However, Dunlop looked to have the race sewn up on his three-cylinder two stroke Honda as he went quicker still on his fifth lap, averaging 118.47mph to reclaim the lead. On the last lap though, he ran out of fuel, leaving Rob to come home ahead of Marshall and Trevor Nation. At the end of the week, Rob and Joey went head to head again in the Classic Race, with Grant also in the mix this time. Dunlop was the early pace setter, but Grant led at the end of the second lap with McElnea third behind Dunlop. McElnea fought back and led Dunlop by ten seconds going into the last lap, maintaining his advantage to win a superb race. That proved to be Rob's final race on the Mountain Course as he went on to have a successful Grand Prix career riding for the Heron Suzuki, Marlboro Yamaha, Pepsi Suzuki and Cabin Honda teams before returning to the UK where he became British Superbike Champion. Injury forced him to retire at the end of the 1993 season but by then he was also managing the BSB Yamaha team, which he did until the end of the 2011 season. Like Graeme Crosby, McElnea had a brief TT history but it had great impact both on his career and others and he remains one of the finest riders ever to have graced the Mountain Course. "I am really excited about being involved in this year's Classic TT and the Joey Dunlop celebrations in particular. Joey was one of the fiercest competitors I ever raced against and I am looking forward to reliving some of those memories on the Island along with a lot of the other riders who were around at that time." and also the Classic on the 1000cc Four Stroke.